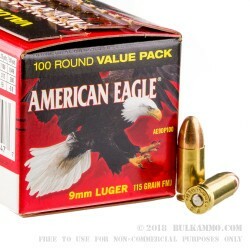 For generations, American shooters have trusted Federal American Eagle for reliable ammunition for their firearms. 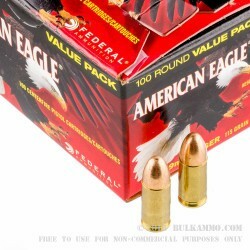 Federal American Eagle ammunition provides shooters with cheap ammunition that is known for its consistent accuracy and high standards of manufacturing. Quality components go into each and every round of ammunition for reliability and consistent performance in handguns and rifles. 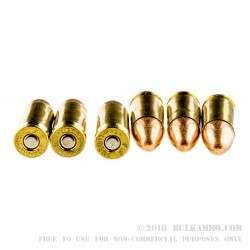 Ammunition is produced with reloadable boxer primers and brass casings. Federal American Eagle 9mm FMJs are perfect for target shooting with your duty, personal defense, or competition pistols. The price will ensure you spend more time at the range, and less time wishing you were shooting. 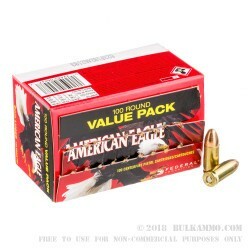 Federal American Eagle 9mm FMJ ammunition has been the choice of Police Departments across the nation for department level target shooting and training. These 9mm cartridges are fully reloadable making them ideal for shooters who shoot and reload their ammunition. super fast shipping - overboxing was great - will buy again from BA!